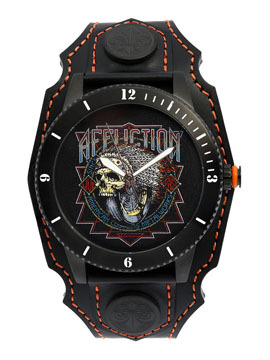 Affliction American Customs Indian Head mens watch features the Affliction American Customs MetalWorks logo with an image of bull run Indian skull, feather headdress and motorcycle wheel in the center. Swiss movement. Mineral Crystal. Genuine leather strap in black accented with orange tool stitching along the border. Double strap closure. Custom hardware, rivets and metal studs. Genuine Leather. Color: black with orange stitching.